In this nightmarish narration, you will hear the terrifying tales of the Fearsome Foursome-four kids who look to out-scare each other. But just wait until they hear my spooky stories. Who am I? I am Amicus Arcane, your librarian and host. Your Ghost Host. So listen along ... if you dare! 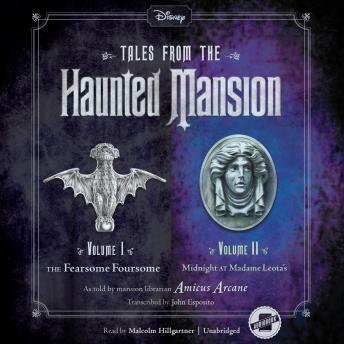 The Haunted Mansion's resident librarian, Amicus Arcane, has returned with another set of spooky stories to share. Follow along with him as he tells new terrifying tales while leading the Mansion's newest visitor to a secret seance with the mysterious Madame Leota. So listen along, foolish mortal, but beware midnight at Madame Leota's!